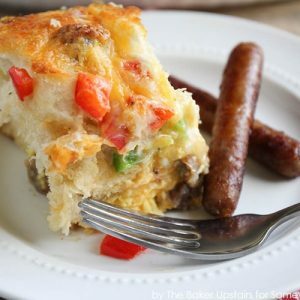 This easy sausage breakfast casserole recipe made with peppers and biscuits is a delicious twist on a breakfast classic! In a large skillet over medium low heat, cook the sausage about 10-12 minutes, or until browned and cooked through. Remove from heat and let cool slightly, then cut into pieces. Lightly grease a 9 x 9 baking dish. Place the biscuits into the bottom of the dish, pressing together to seal. In a small bowl or measuring cup, whisk together the eggs, salt, and pepper. Sprinkle the sausage, green pepper, red pepper, and shredded cheese evenly over the top of the biscuits. Pour the egg mixture over the top. Bake 30-35 minutes, or until the casserole does not jiggle when shaken lightly and the edges are golden. Let cool 5-10 minutes before serving.